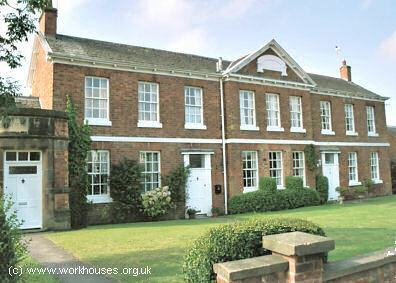 A parliamentary report of 1777 recorded a parish workhouse in opertaion at Ratby with accommodation for up to 14 inmates. County of Leicester: Bagworth, Barlestone, Barton-in-the-Beans, Bilstone, Cadeby, Carlton, Congerstone, Dadlington, Desford (2), Gopsall, Ibstock (2), Kirkby Mallory, Market Bosworth (2), Markfield (2), Nailstone, Newbold Verdon, Norton-juxta-Twycross, Odstone, Orton-on-the-Hill, Osbaston, Peckleton, Ratby (2), Shackerstone, Shenton, Stanton-under-Bardon, Thornton, Twycross, Upton. Later Additions: Groby (from 1896), Sibson (from c.1837), Stapleton (from c.1837), Sutton Cheney (from c.1837), Witherley. The population falling within the Union at the 1831 census had been 11,365 with parishes ranging in size from Bilstone (population 136) to Markfield (1,088) and Market Bosworth itself (1,049). The average annual poor-rate expenditure for the period 1833-5 had been £7,101 or 12s.6d. per head of the population. Market Bosworth workhouse site, 1901. In 1905, a new board-room and boiler-house were erected at the north-east corner of the site. The board-room was later used as a local council-chamber. 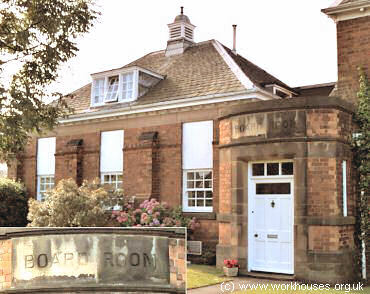 The workhouse later became Westhaven old people's home. Most of the buildings were demolished in 1979 to make way for a housing development. Only the front block and board-room now survive. The Record Office for Leicestershire, Leicester and Rutland, Long Street, Wigston Magna, Leicester, LE18 2AH. Few records survive — holdings include: Guardians' minutes (1875-1930, with gaps); Births register (1915-1930); etc.